We’ve gotten a sneak peak at the upcoming Blitz Elite skin for Rainbow Six Siege, as well as what appears to be a new set of Halloween skins set to spook up your October. All this remains unconfirmed for now, but this would be a whole lot of unnecessary effort for a fake – scroll on for details on what to expect. The Blitz Elite skin is pretty straightforward, but certainly svelte, and gives us a much better look at Blitz’s face than we’re used to. There’s a fancy new shield, and Blitz appears to be experimenting with a splash of colour – all tan and brown, but it’s at least a step beyond black. Jager’s turned skull-faced while wearing old-school aviation gear, and Vigil’s gotten a properly creepy scarecrow mask. 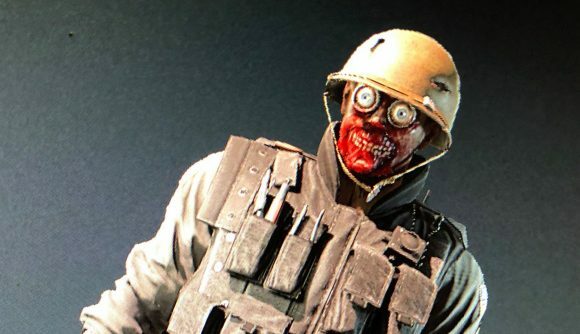 Thermite looks like he’s halfway through that scene at the end of Raiders of the Lost Ark. Valkyrie appears to just be in makeup, but she’s still perhaps the creepiest of all – we’re looking at a full-on ghost nun aesthetic. All the new skins, plus a look at the Blitz Elite animation, comes via xbgd1u on Twitter. Here’s what you can expect. Of course, we don’t yet know how we’ll be getting ahold of those Halloween skins. It could be a direct purchase system as it was last year, or we could see something a little bit more loot box-like, following up on the Sunsplash packs earlier this year. If you’re a little more focused on the nuts and bolts of Siege, keep waiting for the Grim Sky release date – we’re expecting it in a handful of weeks.